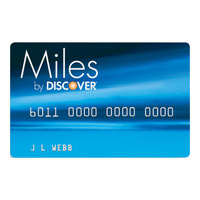 I applied a Discover Miles Card back in July, which offers 12,000 bonus miles, fee-free 0% balance transfer for one year, and additional 1,000 monthly bonus miles for 12 months with any purchase charged with the card (BTW, the offer is still valid). Immediately after receiving the card, I called Discover to confirm the one-year 0% BT and was told that I can make a transfer before October. The Miles Card is designed for those with very good credit who plan to take advantage of the travel reward program. Through the reward program, cardholders earn double miles on up to $3,000 in travel and restaurant purchases and one mile for every dollar spent on general purchases. Earned miles can be redeemed for airfare or reduced airfare on most major U.S.-based airlines with no blackout dates. Miles can also be redeemed for gift cards from 90 brand-name partners or cash. Cardholders earn 1,000 bonus miles in every month that they make a purchase during the first year of cardmembership for up to 12,000 bonus miles. There is a maximum of 60,000 miles that may be accumulated per year, but miles will not expire as long as the account remains active within a 36-month period. Anyway, late last month, as the 0% BT offer about to expire, I called Discover to initiate the transfer, but only got 10 months instead of 12 months. Apparently, when I contacted Discover in July, I only asked if I could get the 0% BT for a year, not the start date of that one year period. I automatically assumed it should start from the time when I make the transfer, which is the case with Citi cards. Not so with Discover. The one-year period actually started at the time when my application was approved. So instead of getting one year, I only have ten months. Five days later on October 3rd, I was again notified via email that a response of the request has been sent to my message box at the card website. Last night, two checks were in the mail. Throughout the whole process, I wasn’t contacted by Citi except the two emails about the progress. Overall, it’s a quite simple and painless experience.